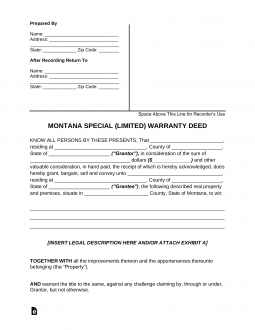 The Montana special warranty deed is a form of document that allows you to legally transfer your real estate to someone else. The person selling the property is generally known as the grantor, while the person purchasing the property is known as the grantee. In a deed, it is important to have the name of the grantor, the grantee and the legal description of the property. The legal description of the property is not the street address, but the description found in the original deed for the property. A special warranty deed comes with a limited warranty, guaranteeing that there are no claims against the property that could arise during grantor’s ownership. Step 1 – First fill in the name of the person who will get the deed after it has been recorded. Usually, this is the buyer or buyer’s attorney. Step 2 – Then include the name of the grantor as well as grantor’s address. Step 3 – Indicate in the box whether or not the grantor is married. Step 4 – Put in the amount of money paid for the property. Step 5 – Then add in the buyer’s information including name and address. Step 6 – Check the box indicating how the buyer intends to own the property. Step 8 – If there are restrictions, include them in the space provided. Step 9 – Sign and date the deed in the presence of a notary and have the notary sign the acknowledgment. Step 10 – The deed should be recorded with the clerk and recorder of the county where the property is.